I'm not an avid traveler. Motion sickness, fear of terrorism, a simple but strong attachment to my own bedroom (husband and cat included) — all things considered, I'd rather stay home. But I can always journey through scent, right? Well, there are so, so many niche perfume lines named after geographical locations these days. Every time I see a new one, I recall a line from the film version of "Hedwig and the Angry Inch," in which the main character remembers her young lover's musical tastes: "He played me songs. The bands were new to me: Boston, Kansas, America, Europe, Asia. Travel exhausts me." 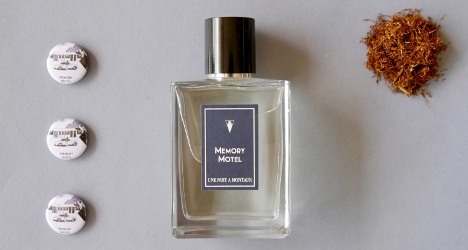 Memory Motel has notes of bergamot, iris, incense, carnation, moss, patchouli, vanilla, tobacco and leather and is described as an androgynous scent and a "burning tribute to those restless, turbulent times." It's not as Stones-like as I might have expected — not nearly enough leather jacket, sweat, or booze — but I found it a pleasant detour from my usual florals. It's a linear and long-lasting incense fragrance with a sweet undercurrent. There's something that reminds me of benzoin, paired with the vanilla. The tobacco is more "pipe" than "cigarette," if that makes sense, and the subtle florals keep it from veering into traditionally "masculine" territory. I have a feeling that Memory Motel isn't complex or dirty enough to thrill my incense-loving colleague Kevin here at Now Smell This, but I've found it wearable yet intriguing enough to enjoy all day. 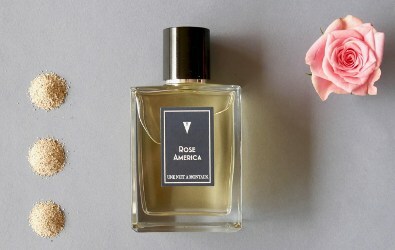 Naturally, since I'm a rose-lover, I've also tried Rose America. This fragrance, with notes of raspberry, sea spray, rose, carnation, heliotrope and ambrette seed, is an ode to the beach roses (rosa rugosa) that grow along the dunes of Montauk. I admired those roses when I visited the Montauk shore all those years ago, so I was looking forward to trying Rose America. It didn't disappoint, although it wasn't quite what I expected, either. It doesn't have the sea-air feeling of Lostmarc'h Iroaz, the salty amber of Les Parfums de Rosine Ecume de Rose or the grassy edge of Dawn Spencer Hurwitz's Beach Roses. It starts off with something that I can't quite identify, a ripe green-berry opening that reminds me a bit of juniper. Then there's a quick wave of starchy aldehydes (meant to evoke "the clean smell of fresh sheets" in a rented summer house) and then a warm, peppery carnation heart. Actually, Rose America doesn't really feel like a rose perfume until it's been on my skin for an hour or two, when a soft rosewater note surfaces and gradually takes over from the carnation. The rose-y dry down lasts pretty well, boosted by the heliotrope and just a hint of berry. Rose America doesn't cling to my skin as long as Memory Motel does, but it still puts in a decent performance for a dreamy floral scent. And even though Rose America's transitions are slightly odd, its unusual development kept me interested. I'd consider buying a small bottle of this one at some point. Overall, I'm glad I took this perfumed trip...and maybe even curious enough to backtrack and try Une Nuit Nomade's earlier Bali fragrances. (Have you tried them already? If so, feel free to share your impressions!) Wishing you safe travels, everyone, wherever you're headed this summer. Une Nuit Nomade Memory Motel and Rose America will be available as 50 or 100 ml Eau de Parfum through the Une Nuit Nomade website. Samples are now available. Their Mr. Vetiver was nice and I quite liked Suma Oriental. But Murmure des Dieux was sickening, it smelled like cooking rice to me. This line is still very hard to find in the US, but I’ll keep my eyes open for the Suma Oriental! These sound interesting but if they are HTF, I may not be as motivated to seek them out. I’m going on an Alaskan cruise in July via Vancouver and I am very much looking forward to revisiting old haunts in Vancouver pre-cruise and hopefully meet up with some NSTers for some smellies, food and vino. I have a first cousin in Victoria but will not be visiting because we don’t really have much in common. I like the film version of Hedwig and the Angry Inch. Have you noticed that “Wake Me Up When September Ends” by Green Day sounds like a song from Hedwig? Thanks for the reviews. I love roses and carnations, so I’ll try to sample Rose America. Tonight I’m testing Yellow Rose by L’Aromatica. So far, I really like it, but I will have to spend more time with the base notes. You so right about that Green Day song. Not sure which came first. Your rose garden/yard sounds gorgeous!! Just chiming in to thank you for the Hedwig reference. I’ve been listening to it on repeat for the last week. I’d forgotten how much I love it. Yeah, Hedwig has a great soundtrack. Have you seen Velvet Goldmine? It’s soundtrack is great, too. Yes and yes! Two favorites of mine. Great soundtracks, great movies about the transformative power of rock, etc.! My friend was a cameraman on the film version of Hedwig – which reminds me… he said he was going to give me the tshirt he got as a souvenir. I’m calling him tonight! Going off-topic to let Jessica know that she gets an enabler pin for her post on micellar water. I ordered a couple from Sephora based on her article, and will probably seek out something from the drugstore, too. I’m always proud to sport the enabler pin! Micellar waters have changed my skin for the better…I hope they’ll do the same for you!